Electric cars produce lower global warming emissions than the average compact gasoline-powered vehicle. The report evaluates regional electricity grids across the United States based on the global warming emissions produced from electricity generation, and then compares the emissions generated by charging an EV with those produced by gasoline-powered vehicles. UPDATE October 2015: Our new report "Cleaner Cars from Cradle to Grave" documents EV emissions on a life cycle basis—from the manufacturing of the vehicle's battery to its ultimate disposal or reuse. Read more here. UPDATE September 2014: Thanks to efficiency improvements, electric vehicles continue to become cleaner. Read more here. UPDATE June 2012: Report and infographic updated with new 2009 power plant data. Electric vehicles (EVs) burn no gasoline and have no tailpipe emissions, but producing the electricity used to charge them does generate global warming emissions. The amount of these emissions, however, varies significantly based on the mix of energy sources used to power a region's electricity grid. For example, coal-fired power plants produce nearly twice the global warming emissions of natural gas-fired power plants, while renewable sources like wind and solar power produce virtually no emissions at all. Click to enlarge. EV emissions depend on how clean your electricity grid is. Nationwide, EVs charged from the electricity grid produce lower global warming emissions than the average compact gasoline-powered vehicle (with a fuel economy of 27 miles per gallon)—even when the electricity is produced primarily from coal in regions with the “dirtiest” electricity grids. 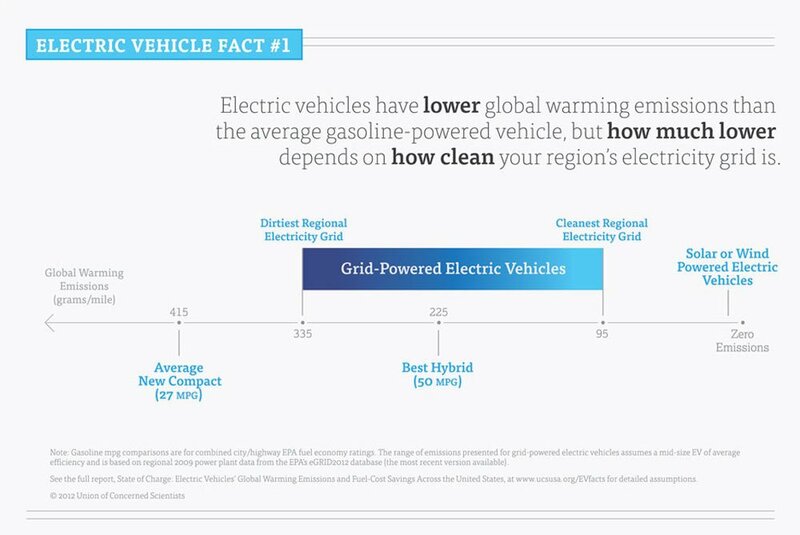 In regions with the “cleanest” electricity grids, EVs produce lower global warming emissions than even the most fuel-efficient hybrids. EVs charged entirely from renewable sources like wind and solar power produce virtually no global warming emissions. 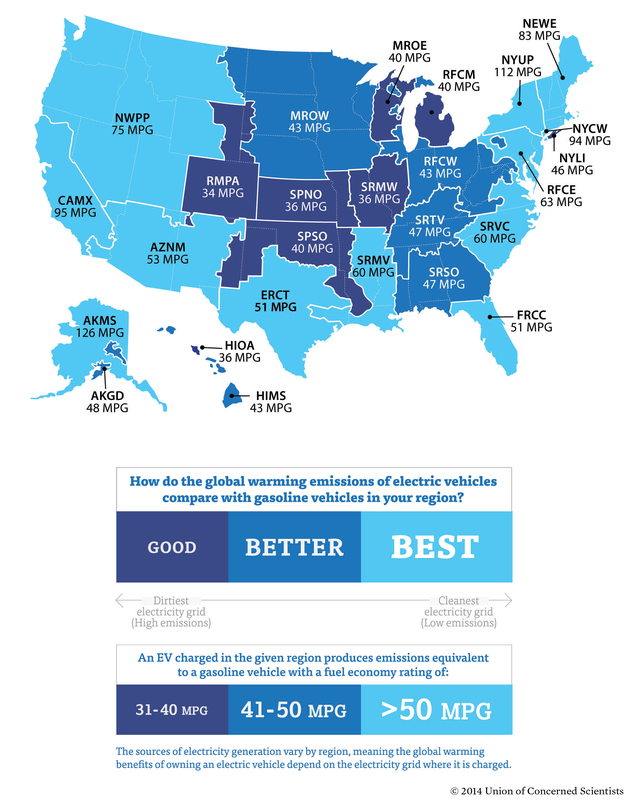 Nearly half of Americans (45%) live in the “best” regions where EVs produce lower global warming emissions than even the most fuel-efficient gasoline hybrids on the market today (greater than 50 mpg). Another third (38%) live in “better” areas where EVs produce emissions comparable to the best gasoline hybrid vehicles (41 – 50 mpg). A minority (17%) reside in “good” regions where emissions from EVs are comparable to the most fuel-efficient non-hybrid gasoline vehicles (31 – 40 mpg). Go Electric. Save Oil. Save Money on Fuel Costs. For example, an EV driver could save nearly $13,000 on fuel costs and use 6,100 fewer gallons of gasoline over the life of the vehicle relative to today’s average compact gasoline car.Driving on electricity is cheaper than driving on gasoline. Driving an EV slashes oil consumption and saves thousands of dollars in fuel costs over the lifetime of the vehicle. Click to enlarge. Different regions produce different EV emissions. Local utility rates determine just how much EV drivers will save. Taking advantage of different rate plans utilities have to offer can help maximize savings. On the best rate plans, electric vehicles can save $750 - $1,200 a year on fueling costs compared to a gasoline vehicle averaging 27 miles per gallon and fueled at $3.50 per gallon. EV owners can save money on fueling costs without changing electricity plans, but taking advantage of rate plans that offer lower-cost electricity at night (“time-of-use” plans) can mean hundreds of dollars in additional savings per year, especially in California.